So after months of campaigning, listening to various hustings, not actually being there obviously because Derby might as well not be on the map when it comes to exciting events, and mulling over Milibands today I cast my vote in what I think is the biggest choice for Labour and the one which will matter in the future. Choices over New Labour and ‘Old Labour’ (although whether any candidates truly believe in that really remains to be seen and also whether they are truly representative of members today), Brownites and Blairites but more importantly moving on from the rifts of the past as a unified party. Coming in at a last and least and definite loser for me was: Ed Balls. Not that I am going to start ripping apart the candidates, I believe that with the right attitude and also a strong shadow cabinet any of these candidates will oust the coalition but when my Tory father started talking about voting for him to ensure Labour were unelectable, alarm bells did start ringing. Now I took at face value accounts reports describing him as ‘Gordon Brown without the charisma etc’ but I must admit a closer look at him he is an amicable and strong candidate with a plethora of ideas for a strong comeback. However it isn’t just about how liked the candidate is liked within the party and I do believe Ed Balls would gain nothing but ridicule, an easy target for opponents to Labour. Okay so then I want someone polished, with charisma and popularity… surely David Miliband fits that role perfectly. Well, not so is the case coming in at my preference. Now I am a David Milifan. In fact he was one of the reasons I joined the Labour party and his way of mobilising support through twitter as well as appearing to be well liked outside the party, even in the bias of the press against Labour. It has to be said however that these past few months David has slipped lower and lower down my list of preference and I think it does have to do with the increasing likeness I am seeing between him and Mr. Tony Blair. I know that David is a different person with different policies but it must be recognised that continuing along the road of new Labour is like flogging a dead horse for a lack of a more original comparison. David Miliband as (shadow 😦 ) foreign secretary however I do like, a lot. So number 3: Diane Abbott Rather a last-minute choice for me really. I have never considered her as a viable choice for Labour Leader and if I thought she might actually win then perhaps my mind would be changed. Anything I had heard about Diane before the leadership election was nothing good, what with the whole so-called left-wing stance with a child at private school. Well, whatever reasons/ excuses that may be legitimate or not, Diane still failed to make much of an impression. However it is what she is perceived to stand for I voted for, the variety of our choices and the importance of this. And perhaps the Labour Party does need a ‘back bench’ sort of leader to really shake itself up. Anyway, in at number 2 was Andy Burnham, what with the publicity focussed so much on the Milibands I admit to overlooking him. However I read somewhere about him saying about ‘Not old Labour, not New Labour but true Labour’ and that really struck a cord with me as I believe that is what this whole election is about, a move away from the rifts of old, forward to solidarity and fight back. 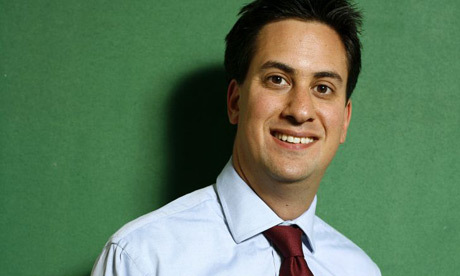 So, of course, number one Ed Miliband was the Miliband for me in the end. To me he seems the most in touch, the most comitted to change and the one who can unite our party together. He had me from the start of his ‘Living Wage’ campaign and his honesty and integrity never faultered. That’s without me even touching on his excellent record as climate secretary.